Clefts of the lip, alveolus, and palate (CLPs) rank among the most frequent and significant congenital malformations. Leu10Pro and Arg25Pro polymorphisms in the precursor region and Thr263Ile polymorphism in the prodomain of the transforming growth factor β1 (TGF-β1) gene have proved to be crucial to predisposition of several disorders. In this study, polymorphism analysis was performed by real-time polymerase chain reaction (LightCycler) and TGF-β1 levels determined by enzyme-linked immunosorbent assay. Only 2/60 Caucasian non-syndromic patients with CLP (3.3%) carried the Arg25Pro and another 2/60 patients (3.3%) the Thr263Ile genotypes, whereas, in a control group of 60 healthy Caucasian blood donors, these heterozygous genotypes were more frequent 16.7% having Arg25Pro (10/60; p < 0.035) and 10,0% having Thr263Ile (6/60), respectively. TGF-β1 levels in platelet-poor plasma of heterozygous Arg25Pro individuals were lower than those of homozygous members (Arg25Arg) in the latter group, but this discrepancy narrowly failed to be significant. Although polymorphisms in codon 10 and 25 were associated with each other, no difference was found between patients and controls concerning the Leu10Pro polymorphism. The genetic differences in codons 25 and 263 suggest that TGF-β1 could play an important role in occurrence of CLP, however, functional experiments will be required to confirm the mechanisms of disturbed development. Clefts of the lip, alveolus, and palate (CLPs) rank among the most frequent and significant congenital malformations. The incidence of about 1:3000 in Africa differs from the rate in Europe (1:500), Asia (1:350), and with the American Indians (1:150) . Concerning non-syndromic clefts the underlying etiology remains unknown, but both environmental as well as genetic factors are considered to be involved . Critical periods for development of CLP (Figs. 1A,1B,1C) are between the 36th and 42nd day of embryogenesis and between the 49th and 58th day for development of isolated cleft palates (Fig. 1D). Linkage studies in affected families have implicated several chromosomal regions that might harbour predisposing genes. These regions include chromosomes 2p13, 4q, 6p23, and 19q13 . Analysis of segregation emphasized that occurrence of CLPs is due to a combination of multi-factorial inheritance and major genetic effect [3–5]. 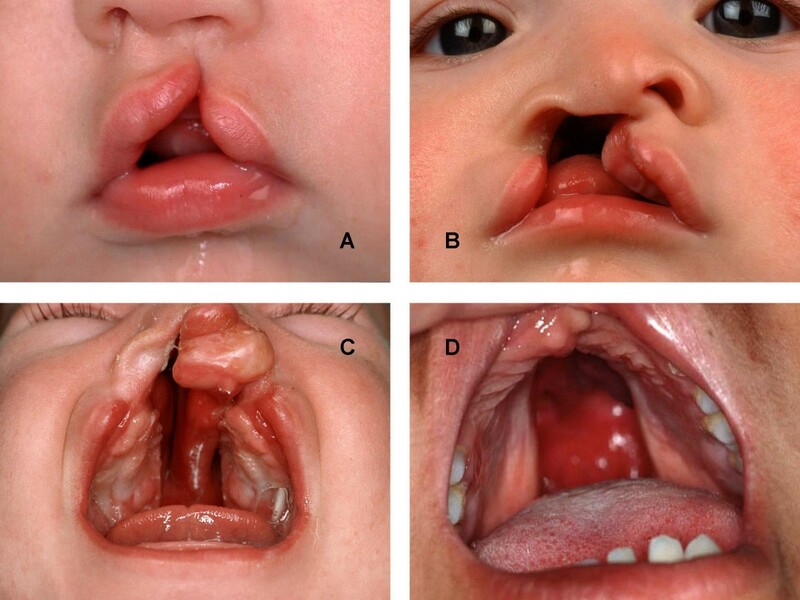 Patients with clefts: (A) incomplete unilateral cleft of the lip, (B) unilateral cleft of the lip, alveolus, and palate, (C) bilateral cleft of the lip, alveolus, and palate, (D) isolated (median) cleft palate. The TGF-β superfamily consists of more than 35 members and represents a large group of extracellular growth factors controlling many aspects of development . There is no sequential homology with transforming growth factor α and its analogue epidermal growth factor. The TGF-β isoforms show a pronounced amino acid homology within the mature C-terminal portion of the molecule and are highly conserved throughout evolution . Homo- or hetero-dimers of the TGF-β family ligands bind to and activate two types of transmembrane serine/threonine-kinase-receptors, which then stimulate downstream regulatory Smad proteins to migrate from the cytoplasm to the nucleus where they can function as transcriptional regulators. There are three isoforms of TGF-β in humans. The 25 kb TGF-β1 locus (TGFB1) was assigned to 19q13.1 in man . More than 50% of TGF-β1 knockout mice die during embryogenesis from yolk sac defects; survivors develop inflammatory disorders and die typically within one month . In humans, mutations in the gene encoding the latency-associated peptide of TGF-β1 lead to the Camurati-Engelmann-syndrome [10–12], which is not associated with cleft formation [13, 14]. Human TGF-β2-gene maps to 1q41 . Lack of TGF-β2 is perinatally lethal and various craniofacial defects, axial and appendicular skeletal defects are evident in TGF-β2 null mice . The TGF-β3 gene is localized to 14q24 in man and lack of TGF-β3 is also perinatally lethal . Cleft palate and delayed lung development are obvious in TGF-β3 null mice [17, 18]. TGF-β isoforms are translated as prepropeptide precursors with an N-terminal signal peptide followed by the prodomain and mature domain and are secreted as biologically latent forms . The Leu10Pro-(T869C) and Arg25Pro-(G915C) polymorphisms in exon 1 of the TGF-β1 gene are located in the signal peptide sequence that is cleaved from the TGF-β1 precursor at the level of codon 29 . The signal sequence allows export of the newly synthesized protein across the membranes of the endoplasmic reticulum. Whereas both leucine and proline are apolar, the Arg25Pro polymorphism corresponds to a change of the big polar amino acid arginine for the small apolar proline closely to the 3' end of the hydrophobic core of the signal sequence. Polymorphisms in the TGF-β1 gene have a significant genetic contribution to the control of TGF-β1 concentration and it was demonstrated that a homozygous (Arg25Arg) genotype is associated with higher TGF-β1 level than a heterozygous (Arg25Pro) genotype . Therefore, the correlation between that genetic polymorphism in TGF-β1 gene and disease status has been studied in a diverse range of diseases [19, 21, 22]. The Thr263Ile-(C788T) polymorphism is located in exon 5 and codes for that part of the TGF-β1 proprotein that is cleaved from the active part at the level of amino acid 278 . It is conceivable that the substitution of the polar amino acid threonine by the apolar isoleucine at codon 263 affects the stability and the activation process of TGF-β1 leading to reduced concentrations of latent and subsequently active TGF-β1 . The aim of this study was to evaluate the correlation of the Leu10Pro, Arg25Pro, and Thr263Ile polymorphisms in the TGF-β1-gene with the evidence of non-syndromic CLP. All Caucasian patients suffering from CLPs and consulting the University Hospital of Aachen between October 2002 and November 2003 were included in this study, but all relatives of one patient who already had been considered, were rejected to avoid misrepresentation due to hereditary accumulation. Patients with known cleft-associated syndromes as DiGeorge syndrome, Nager syndrome, Pierre Robin sequence, Stickler syndrome, and van der Woude syndrome were also excluded. As these syndromes are most often accompanied by isolated (median) clefts of the hard and soft palate, patients with such clefts were omitted too, to escape accidental inclusion of syndromic microforms. All patients or their parents had given their informed consent to participate in this study which had been approved by an appropriate institutional review board. The CLPs were grouped into unilateral or bilateral clefts of the lip, or lip and alveolus, or lip, alveolus, and palate (Table 1). Males were more often affected by CLPs than females (ratio: 36:24). In addition, unilateral clefts were more often located on the left than on the right side (ratio: 29:14). The youngest patient was 4 months, the oldest 52 years of age, corresponding to a mean value of 14.1 years and a standard deviation of 12.4 years. Localization of clefts in the patient group. Sixty healthy Caucasian blood donors served as a control group. Special attention was given to the fact that none of these blood donors or their relatives was contracted by clefts. The sexual ratio of the control group did not differ significantly from the patient group (35 males/25 females), whereas the mean age was 24.3 years with a standard deviation of 5.2 years. Blood-samples were taken by venipuncture and stored on ice for a maximum of 30 min using EDTA as anticoagulant. For enzyme-linked immunosorbent assay (ELISA), centrifugation was performed for 10 min at 1000 g and 4°C. The supernatants were centrifuged again for 10 min at 10000 g and 4°C for complete platelet removal and stored at -80°C in aliquots. DNA was extracted from peripheral blood cells using the QIAamp DNA Blood Mini extraction kit (Qiagen, Hilden, Germany). The defined single-nucleotide polymorphisms T869C and G915C in exon 1 and C788T in exon 5 of the human TGF-β1 gene were genotyped in a LightCycler (LC)-system (Roche Diagnostics, Basel, Switzerland) as previously described . Briefly, patients sample DNA (approximately 80 ng) was first amplified in the presence of primer for-1 [5'-d(CTA GGT TAT TTC CGT GGG)-3'] and primer rev-1 [5'-d(CCT TGG CGT AGT AGT CG)-3'], or primer for-2 [5'-d(AAGCAGGGTTCACTACCGGC)-3'] and primer rev-2 [5'-d(AGG CCT CCA TCC AGG CTA CA)-3']. Subsequently, the amplicons were analyzed by different combinations of anchor and sensor probes. These were: Leu10Pro-anchor probe [5'-d(TCC CCC ATG CCG CCC TCC GGG CT-3')-fluorescein], Leu10Pro-sensor probe [LC-Red640-5'-d(CGG CTG CTG CCG CTG CT-Ph)-3'], Arg25Pro-sensor probe [LC-Red640-5'-d(ACG CCT GGC CCG CCG-Ph)-3'], Arg25Pro-anchor probe [5'-d(GCT ACC GCT GCT GTG GCT ACT GGT GCT-3')-fluorescein], Thr263Ile-anchor probe [LCRed640-5'-d(GAG AGG GCC CAG CAT CTG CAA AGC T-Ph)-3'], and Thr263Ile-sensor probe [5'-d(ATG GCC ACC CCG CT-3')-fluorescein], respectively. Sequencing reactions of cloned DNA fragments were performed essentially as described previously using the Big Dye®-Termination-Cycle-Sequencing-Ready-Reaction-kit (Applied Biosystems, Weiterstadt, Germany) . Active plus acid-activatable latent TGF-β1, TGF-β2, and TGF-β3 were measured in platelet-poor plasma. The assays for detection of TGF-β1 (DB100), TGF-β2 (DB250), and TGF-β3 (DY243) were purchased from R&D Systems (Minneapolis, MN) and measurements were carried out in accordance with the manufacturer's instructions. Statistical analysis was performed using Statistica 6.1 for Windows (StatSoft, Tulsa, OK) data analysis software system. A probability level of p < 0.05 was regarded as statistically significant in all tests. Active and acid-activatable TGF-β1 was detectable in platelet-poor plasma of all included patients by ELISA. The mean value was 2.715 ng/ml with a standard deviation of 1.622 ng/ml and a range from 0.812 ng/ml to 8.104 ng/ml. There was no correlation with age, gender, and type of clefts. In the control-group TGF-β1 plasma levels did not differ significantly from the patients group showing a mean value of 2.756 ng/ml, a standard deviation of 1.507 ng/ml, a minimum of 0.945 ng/ml, and a maximum of 7.786 ng/ml. Again, there was no significant correlation with gender and age. The ELISA-technique used in this study resulted in very low levels of TGF-β2 and TGF-β3 below 0.2 ng/ml in plasma samples making a comparison between both groups unfeasible. Only 2/60 patients (3.3%), both suffering from bilateral CLPs, showed the heterozygous Arg25Pro-genotype in the TGF-β1 gene as determined by real-time polymerase chain reaction (LightCycler; Fig. 2), whereas all of the others (96.7%) were homozygous (Arg25Arg; Table 2). The TGF-β1 plasma concentrations of these patients were 0.968 and 2.156 ng/ml respectively. In contrast, in the control group, the Arg25Pro genotype was discovered in 10 cases (16.7%) and Arg25Arg in the other 50 (83.3%). This represents a significant difference in Yates corrected Chi-square test at a significance level of p < 0.035. TGF-β1 concentrations of heterozygous individuals were notably lower than those of homozygous in the control group, but this difference narrowly failed to be significant (Fig. 3). Molecular analysis of the TGF-β1 allele variations at codon 25: (A) representative derivative melting curves of a representative LightCycler run for analysis of the Arg25Pro gene polymorphism in the TGF-β1 gene. Samples shown are: no template control (blue line) Arg25Arg (red line), Arg25Pro (black line), respectively. The amplified products of this LC run were separated in a 1.5% agrose gel showing the expected amplicon 523-bp in size (inlet). (B) Sequence analysis of the Arg25Pro alleles. 80 ng genomic DNA from a patient having a heterozygous allele constellation was taken as template in standard PCR and amplified using primers Arg25Pro-for and Arg25Pro-rev. 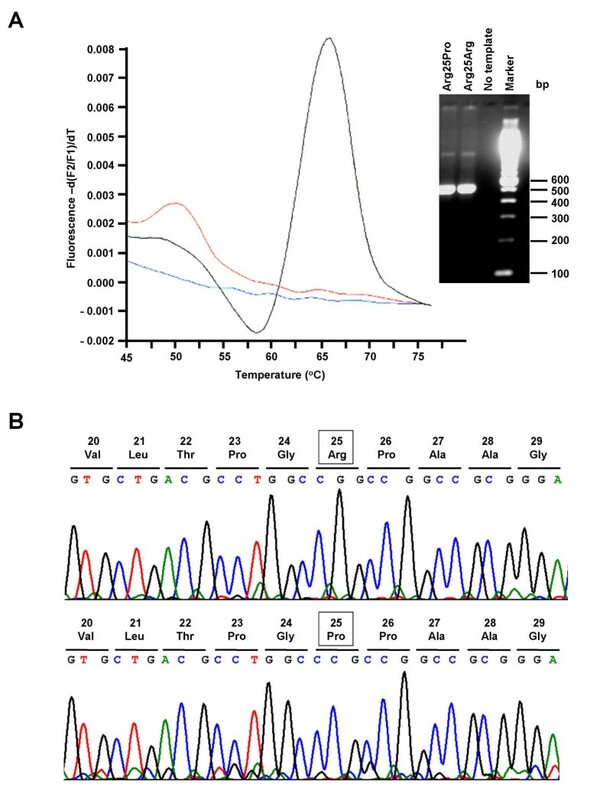 Amplified DNA was gel purified, cloned into the pGEM-T Easy vector, and sequenced with primer Arg25Pro-for on the sense strand on the ABI PRISM310 Genetic Analyzer. The upper chromatogram was derived from the Arg25-allele, the lower chromatogram from the Pro25-allele. Amino acids Arg25 or Pro25 encoded by the polymorphic site (CGG or CCG) are boxed. There was a significant difference in Arg25Pro polymorphism between patient and control groups using Yates corrected Chi-square test (p < 0.035). The different distribution at codon 263 failed to be significant, but summarizing the individuals, who were homozygous at both codons, compared with individuals, who where heterozygous either at codon 25 or at codon 263 or at both codons, the difference between the patient and control groups was even more striking (p < 0.015). Plasma levels of TGF-β1 determined in ELISA were distinct between homozygous Arg25Arg and heterozygous Arg25Pro individuals in the control group. But this difference narrowly failed to be statistically significant (Mann-Whitney U test). The exchange of leucine by proline at codon 10 was significantly positively correlated with the Arg25Pro genotype in both groups (p < 0.025). In particular, the occurrence of the homozygous Leu10Leu genotype excluded the simultaneous presence of the heterozygous Arg25Pro genotype, but there was no difference depending on affection by clefts (Table 3). No significant difference in Leu10Pro polymorphism between patient and control groups could be revealed, although the exchange of leucine by proline at codon 10 was positively correlated with Arg25Pro genotype calculated by Yates corrected Chi-square test (p < 0.025). Two of the 60 patients (3.3%), one with a bilateral and one with a unilateral left-sided CLP, showed the heterozygous Thr263Ile genotype, whereas all of the others (96.7%) were homozygous (Thr263Thr; Table 2). The TGF-β1 plasma concentrations of these heterozygous patients were 1.832 and 0.994 ng/ml respectively. Both patients were non-identical with the two heterozygous Arg25Pro patients. In the control group 6/60 individuals (10,0%) were heterozygous (Thr263Ile) whereas all of the others (90.0%) were revealed to be homozygous (Thr263Thr). One of these heterozygous controls simultaneously was heterozygous at codon 25 and showed the lowest TGF-β1 plasma concentration of all individuals in this group. Summarizing all individuals who were heterozygous either at codon 25 or at codon 263, or at both of these loci in that single case, the difference between the patients group with 4/60 heterozygous cases (6.7%) and the controls with 15/60 heterozygous cases (25.0%) was even more striking (p < 0.015) than considering the Arg25Pro polymorphism alone (Table 2). The temporal and spatial separate distribution of TGF-β isoforms in the developing palate suggests an important isoform-specific role in this developmental process, particularly as they exert several biological activities that control cell proliferation, migration, differentiation, regulation of extracellular matrix deposition, and epithelial-mesenchymal transformation . Mice lacking TGF-β3 exhibit an incompletely penetrant failure of the palatal shelves to fuse leading to cleft palate. The defect appears to result from impaired adhesion of the apposing medial edge epithelia of the palatal shelves and subsequent elimination of the mid-line epithelial seam by apoptosis [17, 18]. No craniofacial abnormalities were observed, demonstrating that TGF-β3 inhibits palatal shelf fusion by a primary mechanism rather than by effects due to craniofacial defects as in TGF-β2 null mice showing clefts in only 23% . In contrast, TGF-β1 knockout mice never develop any kind of CLP . Moreover, a human in vitro model gave evidence that TGF-β1 and TGF-β3 are differently expressed in normal as well as cleft palatal fibroblasts suggesting that both isoforms may exert distinct or even antagonistic functions . The very low plasma concentrations of TGF-β2 and TGF-β3 determined by ELISA are in agreement with previous studies . Though the levels of TGF-β1 protein in plasma have been measured in a lot of studies to date, the reported mean values range from 0.1 ng/ml to more than 25 ng/ml. There is a large number of factors, which is likely to contribute to the great variance of described TGF-β1 protein concentrations in plasma from healthy individuals. One of the most important seems to be the method used to prepare the plasma samples because it is difficult to prevent a small amount of platelets from degranulation during sample collection and plasma preparation, and platelets are a rich source of TGF-β1. Measurements of plasma levels of TGF-β1 therefore require the use of specific protocols designed to minimize platelet degranulation . However, most likely the variation in reported plasma TGF-β1 concentrations is due to the selection of different assay methods. Therefore, it is necessary to compare the results with a control group tested under equivalent conditions. Furthermore, it is difficult to speculate on the biological implications of TGF-β1 levels in plasma, particularly regarding the nature of the complexes present . Tissue levels in critical periods for the development of CLPs during embryogenesis could be completely different from postnatal plasma concentrations and it is not necessarily possible to deduce the biological activity. Thus, a genetically based technique should yield more reliable results as this was described in hypertension , myocardial infarction , atherosclerosis , colon , breast , and ovarian  cancers, diabetic nephropathy , asthma , multiple sclerosis , and liver fibrosis . Interestingly, polymorphisms in the TGF-β1 gene showed no correlation with the severity of symptoms of the Camurati-Engelmann-disease . The distribution of gene polymorphisms in our control group totally agrees with those of the studies mentioned above. No distinction in TGF-β1 plasma concentration was provable between patients with CLPs and controls. Nevertheless, the genetic divergence in TGF-β1 polymorphism suggests that TGF-β1 could play an important role in occurrence of CLP. It is of special interest in this context that the TGF-β1-locus at 19q13.1  is congruent with one chromosomal region (19q13) that might harbour predisposing genes according to linkage studies in affected families . 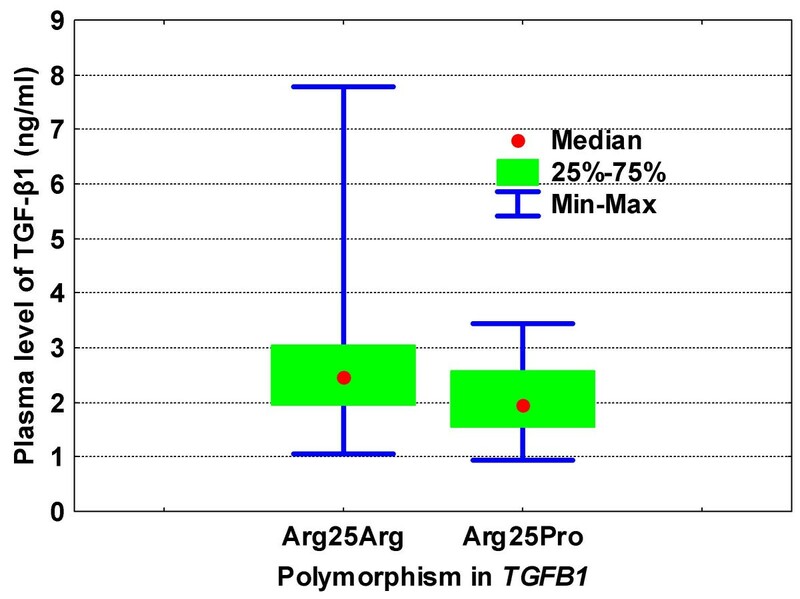 Taking into account that TGF-β1 concentration depends on Arg25Pro and Thr263Ile polymorphisms in the TGF-β1-gene and is lower in heterozygous individuals, CLPs may develop more frequently under increased influence of TGF-β1, however, functional experiments will be required to confirm the mechanisms of disturbed orofacial development. This work was supported by a grant from the Federal Ministry of Education and Research of Germany (Network of Competence in Medicine Hep-Net). CS participated in the design and coordination of the study, cared for the patients, performed statistical analysis, and drafted the manuscript. SM and DS carried out the molecular genetic studies and the immunoassays. DR participated in the coordination of the study. AMG and RW conceived of the study, and participated in its design and coordination. All authors read and approved the final manuscript.